The government plans a move to install two crore pre-paid meters to ensure cent percent pre-paid metering system in the next 3 years to reduce the system loss, ghost billing, consumers' sufferings and other anomalies in the power sector. "We have installed 800,000 pre-paid meter across the country, while 27 lakh meters are under procurement process," Director General of Power Cell Engineer Mohammad Hossain said. He said the government would install two crore pre-paid meters across the country and six power distributor companies have been working to set up the pre-paid meters. Bangladesh Power Development Board (BPDB), Dhaka Power Distribution Company (DPDC), Dhaka Electric Supply Company Ltd (DESCO), Bangladesh Rural Electrification Board (BREB), West Zone Power Distribution Company Ltd (WZPDCL) and Northern Electricity Supply Company Limited (NESCO) are working to install pre-paid meters. The pre-payment metering system can reduce accounts receivable and non-technical losses up to zero per cent. 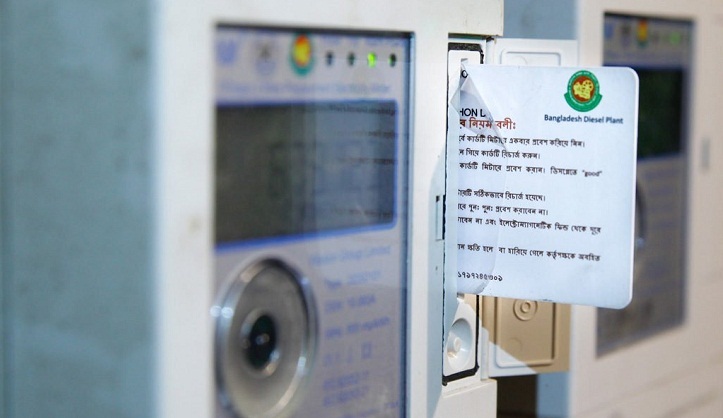 The BPDB took a pilot prepaid metering project in Chittagong, before installing pre-paid meters across the country, the DG said. Talking to BSS, Managing Director of DPDC Engineer Bikash Dewan said the DPDC has installed over 2.30 lakh pre-paid meters, adding, "We will install around 300,000 pre-paid meters this year and some 11.35 lakh pre-paid meters would be installed in phases." He said the DPDC has been trying to bring all of its subscribers under pre-paid billing system coverage in phases. The government installed around 800,000 pre-paid meters and only 1.55 lakh consumers in the capital city are currently using pre-paid meters. As the largest electricity supplier in Dhaka, the DESCO installed 82,732 pre-paid meters out of a total 826,309 subscribers. It will also install 200,000 pre-paid meters by 2019. Another DESCO project is to install 200,000 smart pre-paid meters. Earlier, the Bangladesh Energy Regulatory Commission (BERC) asked the distribution companies to increase the number of top-up booths so that the consumers can easily recharge their pre-paid systems.